The Moby/M70’s open Android Nougat OS allows ISVs and developers to get to market faster and distribute apps seamlessly through the Google Play Store and other available app stores. Developer-friendly SDKs simplify hardware and gateway integration and make it easy to create custom tablet apps. The Moby/M70 leverages Ingenico’s pre-certified RP457c, which eliminates the time and cost associated with meeting certification requirements, including PCI PTS SCR 4.1, EMV L1 and L2, EMV L1 contactless, Visa payWave and Mastercard contactless. Certified to the leading U.S. payment processors, this turnkey tablet POS solution accepts all of the latest payment types, including EMV, magstripe, and NFC/contactless. Each device is supported for multiple years and includes Ingenico Group’s Services and Support for distribution, repair and warranty. The Moby/M70’s open platform, upgradeable OS and flexible design make it an ideal choice for a wide range of in-store, out-of-store and onboard mobile use cases. The open Android platform allows merchants to extend the Moby/M70’s capabilities by running additional business apps for inventory management, loyalty programs and more. Additionally, the Moby/M70 can be white labeled allowing ISVs and end users to custom brand the device. 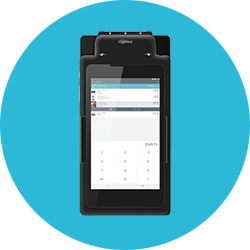 The Moby/M70 tablet POS provides enterprise-class features, including Corning® Gorilla® Glass with a capacitive touchscreen, a long battery life (4,160 mAh), and seamless high-volume payment acceptance capabilities. Full suite of accessories include a ruggedized rubber case, single-bay and multi-bay chargers as well as hand and shoulder straps for ergonomic access. Smart stands can power the solution as well as connect additional items, such as cash drawers, scanners, printers and Ethernet cables. 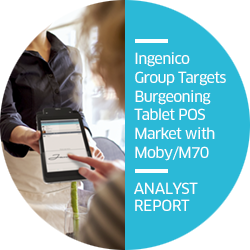 Download this analyst report from 451 Research to get industry expert, Jordan McKee's, first-hand review of Ingenico Group's EMV pre-certified, open Android tablet POS solution - the Moby/M70.